Sídhel has a stronger face, so I decided to give her stronger lines in her clothing. Her coat and boots are made from a sheet of wool felt, which always have a stiffer feel. 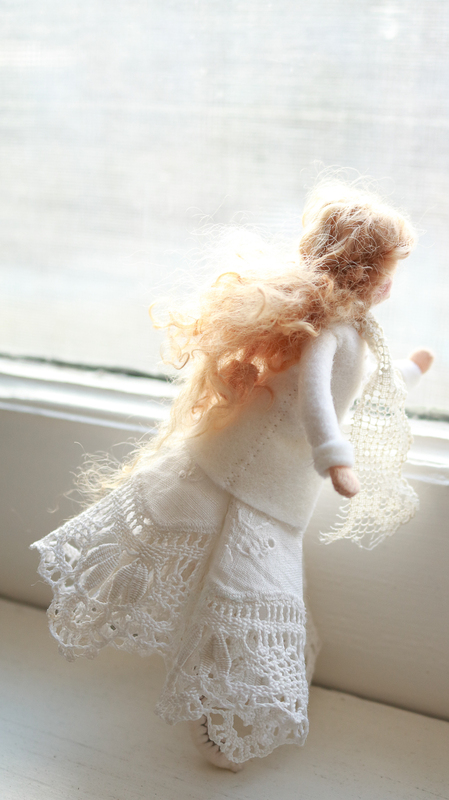 Her bloomers are a crisp linen, and she’s wearing a little doily skirt that came from Holland. 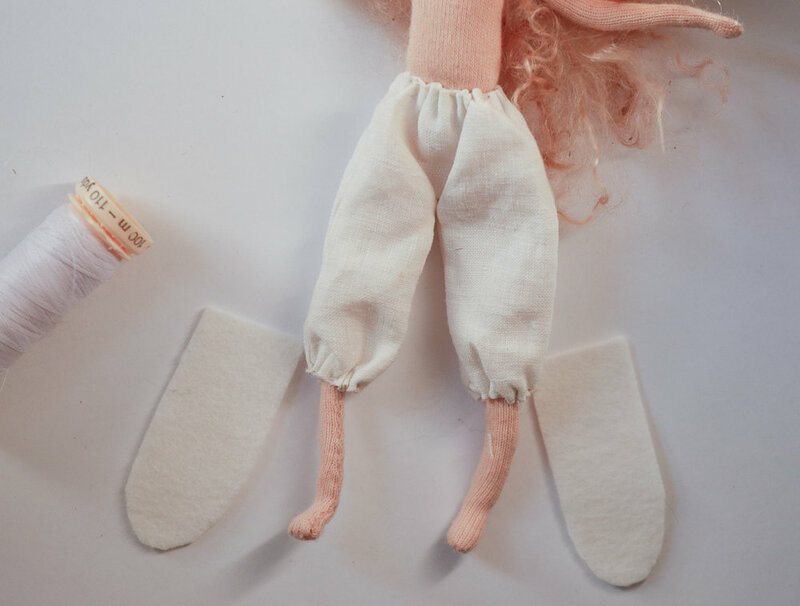 Cut out two rectangles for your bloomers. Sew both sides together with very fine stitches. Flip inside out and put on your faerie. 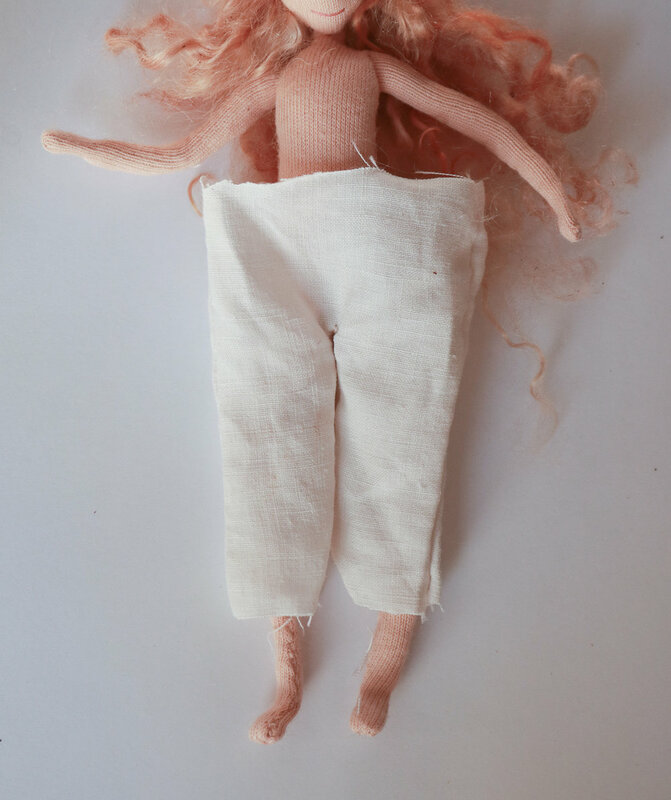 Sew a tiny running stitch around the waist, turning the seam over as you go. Synch and stitch in place. Do the same for her legs. Cut two little rectangles with rounded edges for your boots. Make sure they will just fit around your legs. You don’t want any extra fabric or they will be bulky. Sew down the front with matching thread in a little cross stitch. Trim any extra length you have, so the wool ends a few mm past your toes. Continue right down over the toe, trimming again if you need. You should be able to end in a tiny point. If you would like laces, sew a cross stitch all the way down. You can cut out the pieces like I have here, from the pattern, and then trim them down to fit your faerie. Or use it as a guide and cut on that will work for you. Stitch all the way up to the wrist with a blanket stitch. 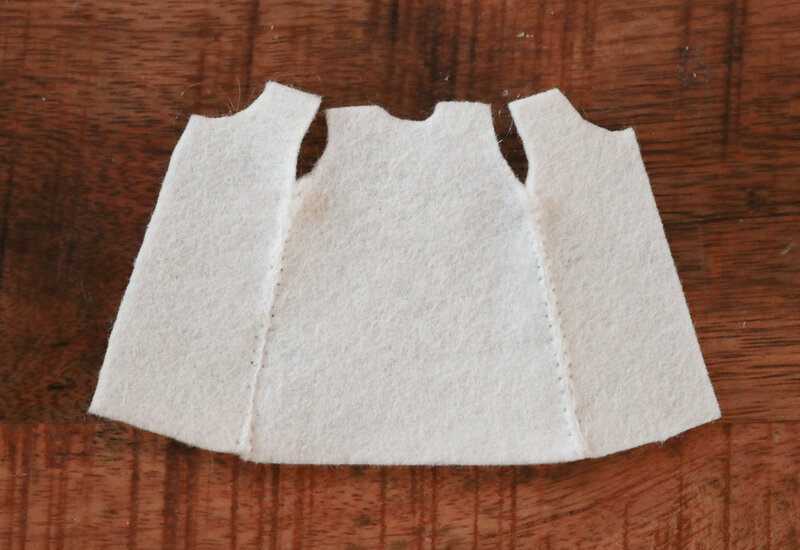 If you have a round doily or even a square hankies that is small enough, you can just cut a tiny hole in the centre and you have a little skirt. I added a couple of darts so it would fit better. Fasten front with a row of stitches. You can sew little French knots for buttons. Attach the arm to the jacket. Flip any excess over for a little cuff.